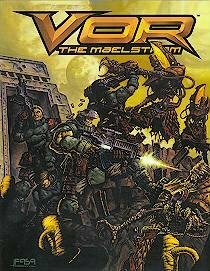 VOR: The Maelstrom was a 1999 figurines-based wargame from FASA. It was a solid design and concept. 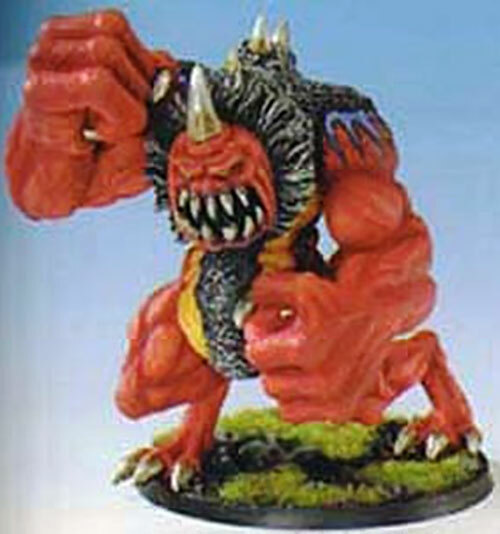 Alien species the Growlers were among the notable creatures featured in the game. Growlers are huge, physically powerful, carbon-based life forms. Their body structures are very well protected by layers of muscle and hide, with razor sharp claws and fangs as their weapons. They have a crude form of hive mind, known as a pack mind, which allows all growlers from a single pack to keep in touch with all other members. One unique feature of their physiognomy is their genetic variability. Once a pack has moved to a drastically different environment, they will change to match their environment. For example, after many generations near and in volcanic regions, the Firegut growlers are actually almost totally immune to heat. They even can spew out superheated steam, or digestive juices that can ignite combustibles. As a Chieftain, their connection to the Packmind is much stronger, enabling them to keep tabs with other members at up to a mile away. This alien race began on the planet Primordia, millions of years ago. After being brought into a cosmic storm called the Maelstrom, a massive nickel-ferrous asteroid impacted against their homeworld. The Growlers adapted, by incorporating the metals into their diet. It settled in their bones, claws, and teeth, making them extremely durable. Discovered by travelers from other worlds also trapped in the Maelstrom, the Growlers were taken to other worlds. Breaking free, they flourished elsewhere, and now can be found on nearly any world. Adult male Growlers, the hulking bulls are immensely powerful. Resembling a cross between a giant ape and a tyrannosaurus rex, with brilliantly colored and painted hides, they have no visible nose or ear structures, small eyes, and wicked mouths filled with dozens of needle-sharp fangs. The Razorback Growlers, who are the most common, are usually reddish, with black outlined blue patterns on their back and shoulders. As Chieftains, the appearance of size is even greater, thanks to a stiff mane of wire-like hair, surrounding the head, and tufting around the spikes that sprout down their backs. Eat, sleep, breed, and fight sums up the personality of most Growler breeds, though not necessarily in that order. They see anything weaker than them as food, an appelation that somehow also applies to trees, boulders, armored vehicles, and the like. The Growlers could be anything from a Project: Cadmus experiment that went awry, to a race that stowed away on Khund ships. Growth: Power Always On and Already factored In. Bluefang Growlers: -1 Dex, +1 Str. Whitetusk Growlers: -1 Str, +1 Claws. Firegut Growlers: -1 Str, Flame Project: 08 (Chieftain only). Their ability to adapt takes several generations, and thus isn’t an individual-level Power. Source of Character: VOR: The Maelstrom.